Wing span: 1 3/8 - 2 1/4 inches (3.5 - 5.7 cm). Identification: Upperside of wings orange in both sexes; orange-yellow form rare. Forewing with small black cell spot. Male with sharply defined black borders on outer and costal margins; female borders not so well-defined. 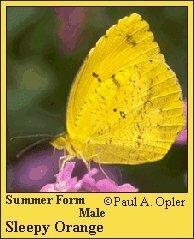 In winter form, underside of hindwing is brick red, brown, or tan; in summer form it is orange-yellow. Life history: Males patrol flats and gullies for females. Females lay eggs singly under host plant leaves. Caterpillars eat leaves. Dry season form overwinters and lays eggs in spring. Flight: Four-five flights, all year long, in southern Texas and Deep South. Mid- to late summer in the north. Caterpillar hosts: Cassia species in the pea family (Fabaceae). Adult food: Nectar from many species of flowers, including shepherd's needle (Bidens pilosa). Habitat: Low elevation areas including pine flats, fields, desert scrub, gardens, vacant lots, road edges, and washes. Range: Central America north to along the United States-Mexico border; vagrant to non-mountainous parts of the eastern U. S. south of 40 latitude; rare stray to Ontario, Connecticut, South Dakota, and Colorado. Opler, P. A. and G. O. Krizek. 1984. Butterflies east of the  Great Plains. Opler, P. A. and V. Malikul. 1992. A field guide to eastern  butterflies. Press, Stanford, Calif. 583 pages, 64 color plates. Co., Boston, Mass. 370 pages, 23 color plates.